At the South Arm Community Kitchen, Vanessa brought along a new friend, Ming. Ming is from Beijing and she was a chef back there. We are fortunate to learn from Ming how to make jiaozi from scratch. Yes, even the dough is made from scratch. The timing is just right as Chinese New Year is just around the corner. Jiaozi is a traditional food during Chinese New Year. Ming enlightened us on why jiaozi is eaten during Chinese New Year. For one, the shape of jiaozi resembles the gold ingots which is a form of money used during the past. 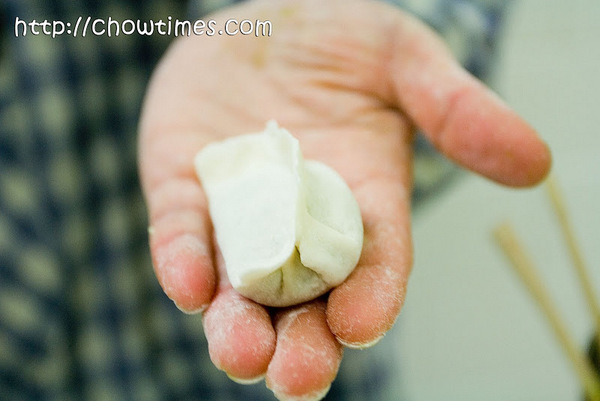 Therefore, jiaozi is believed to bring wealth in the new year. 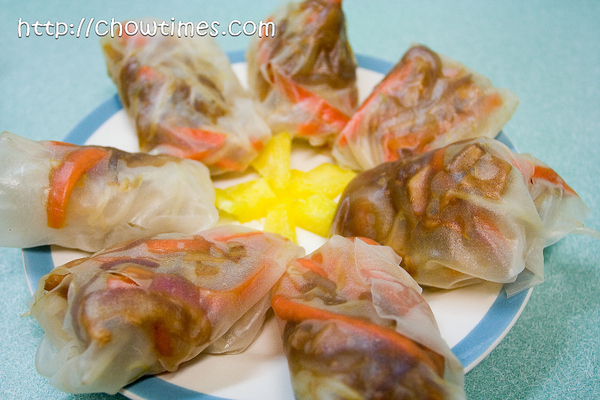 Also, the Cantonese believes that the way the filings is wrapped in a wrapper keeps the wealth within the family. 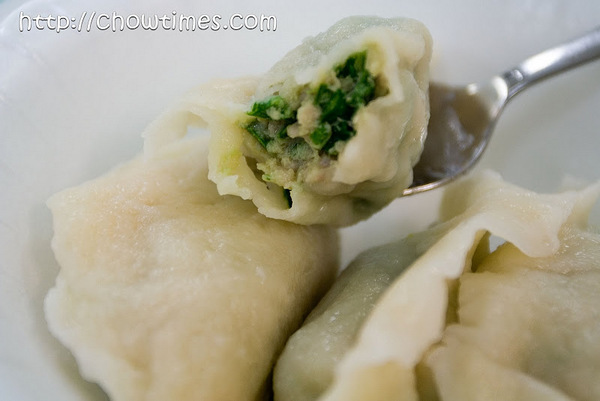 Jiaozi is also believed to get its name from the shape which resembled horn shape. 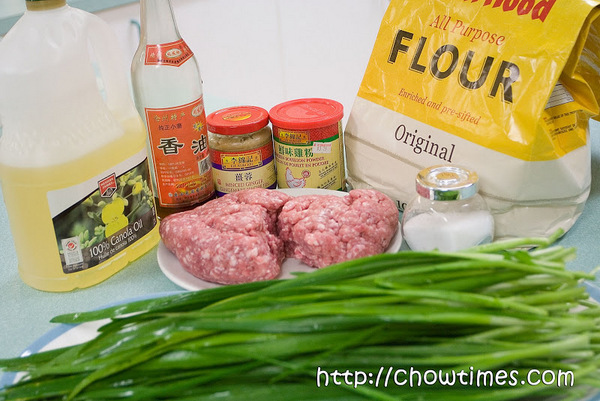 There are various filings for jiaozi. Garlic chives or also known as Chinese chives is the most common one. The mild garlicky flavour of the chives complements the flavour of the pork very well. I had blogged about other types of jiaozi here and here. The garlic chives has flat leaves unlike the regular chives which has hollow rounded leaves. The second dish which Minoo made was Hawaiian Meatball. 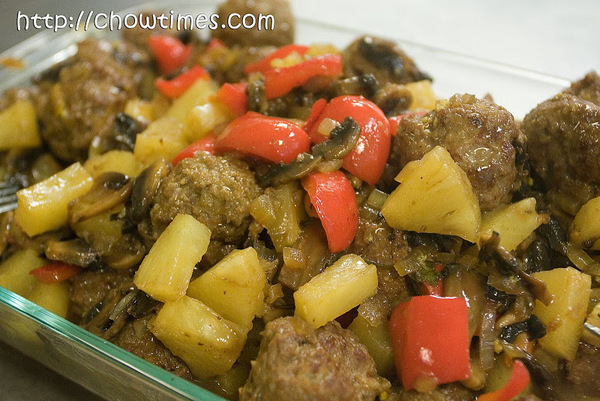 The sweet and sour meatballs are very appetizing and kids will love this dish. Try and make it for your family. 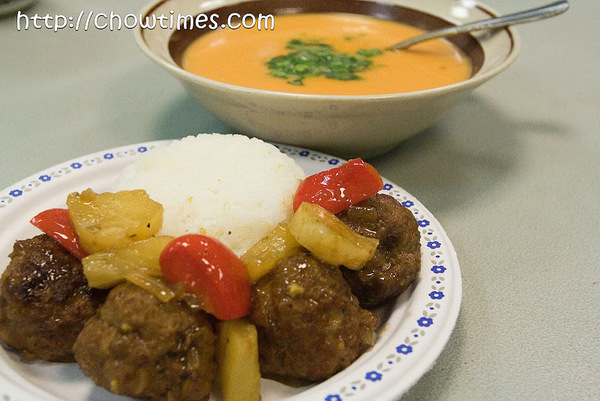 Minoo served the Hawaiian Meatballs with steamed rice. A little more sauce will be perfect to go with the rice. The Hawaiian Meatball is good for potluck too. Minoo kicked start the Caring Place Community Kitchen with two dishes. The first dish is Roasted Sweet Potato soup with orange and ginger. 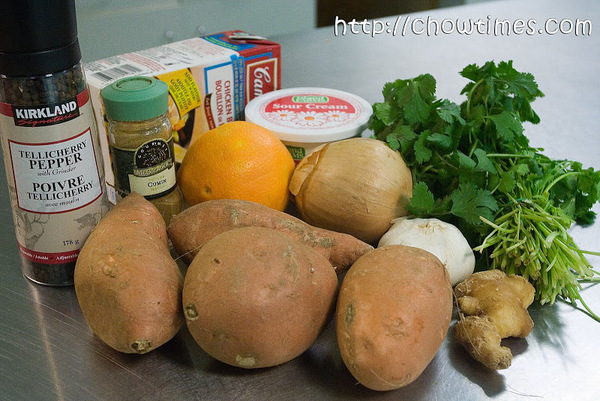 You may make this dish with yam, pumpkin or other winter squashes. 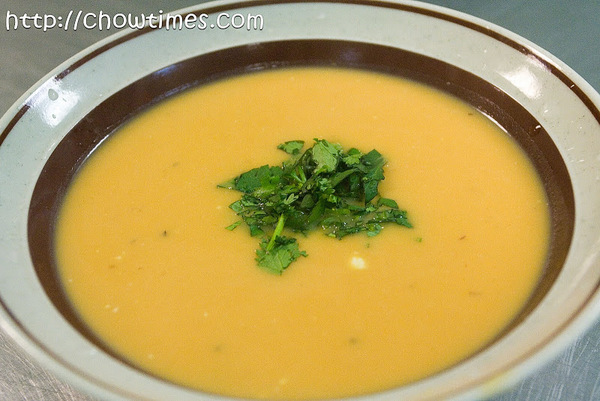 This Roasted Sweet Potato Soup is a creamy soup flavoured with orange zest and grated ginger. It is best served warm. The creaminess of the soup comes from the sour cream. However, you may substitute the sour cream with a couple tablespoons of peanut butter and it’s equally good. 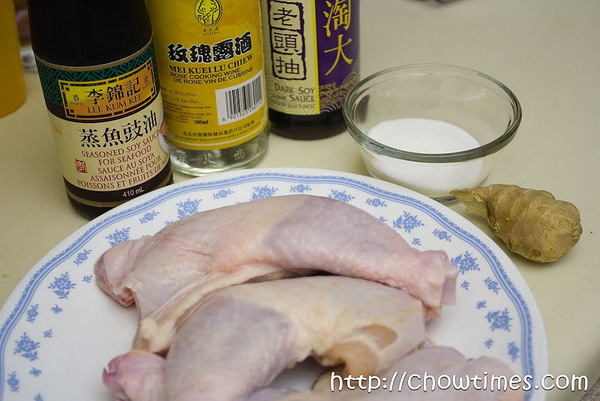 One day, while Polly and I were browsing through some Chinese magazines looking for the recipe for Ma Lai Ko (unfortunately we cant find it, if someone out there has a tested recipe, please share), we came across this interesting recipe, Rice Cooker Soy Sauce Chicken. The name caught my attention and I asked Polly to translate the recipe for me to try it out. I had a rice cooker which has been put away for a long time as the non-stick pot does not behave as it should be. Every time I cooked rice with it, I lost about one bowl of rice as they stick to the bottom. Since then, I have been cooking my rice on the stove. 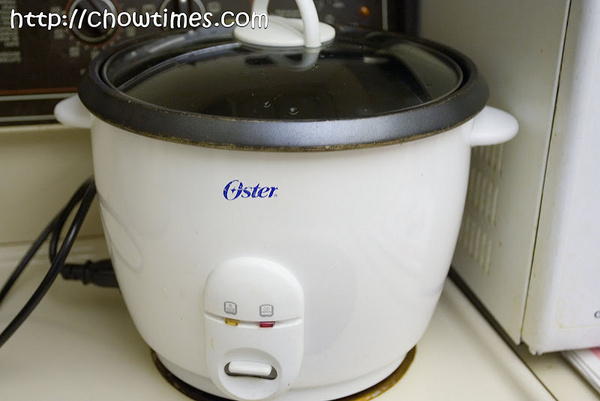 When I saw the recipe, my long abandon rice cooker came to my mine. At least, I can make use of it for this dish. The Rice Cooker Soy Sauce Chicken turned out to be pretty good. 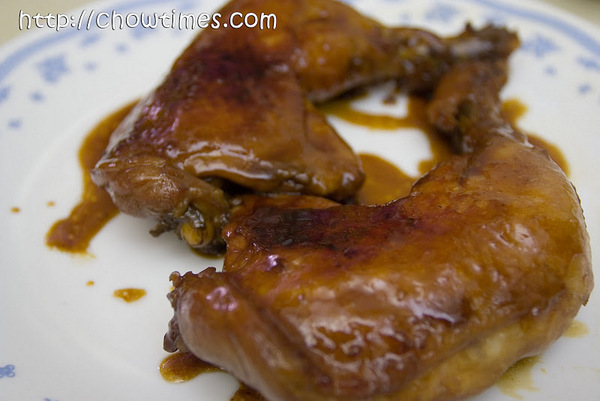 The caramalized sauce is great to go with steamed rice. Arkensen and Nanzaro love this dish. I find that the original sauce is too salty. I will try out my recommendation the next time I make this. The recipe is very simple. Wash and pat dry the chicken. 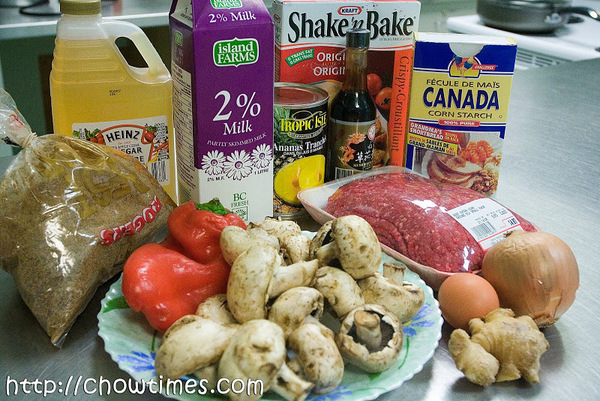 Place all ingredients into the rice cooker, cover and bring to a boil. Turn the chicken every 15 minutes, twice. Whew! It took us an entire weekend to migrate chowtimes to WordPress. We know it is still rough around the edges but the good thing is we’re back in business. We will take the next few weeks to cleanup the odds and ends. If you had bookmarked any of our internal pages, please note that they will not work anymore. This is because WordPress names pages different from MovableType and we decided that it is best adopting fully what WordPress does. Oh … ignore the corvette on the header page. We’ll fix that later on to something more foody. Update 26Jan 5pm: We got going again. We have created an interim site here if you want to have a sneak peak. Migrating all our photos will take a long time … estimated 7 hrs. We’ve got more pictures than we thought we had! Update 26Jan 5am: Sigh … this is going to take longer than I thought! Am utterly stuck at this and working out the steps with my new hosting’s support. Stay tuned. 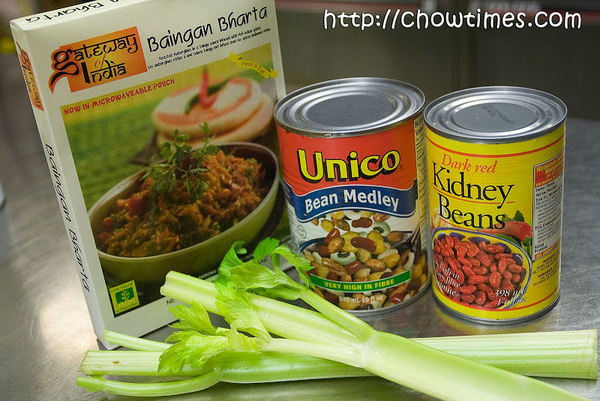 Suanne and I will start migrating chowtimes.com from MovableType to WordPress starting tonight. If all goes well, you will not notice any difference except that when we are done, you will see a new look and feel of the site. It’s a complex move for us because we had not done it before. However, we felt that we must migrate it sooner or later because we were so impressed with what WordPress could do better and easier than what we can do on MovableType. We should be be done by end of day Saturday. Wish us luck! So, to tide you guys over for the next little while, I want to announce to chowtimes reader my new blog … http://26miler.com. I hope you will enjoy it as much as you had on chowtimes. It is a chronicle of my attempt to complete (notice that I did not say run) the marathon this year. Karen brought a couple of her vinegar and oil for us to taste as she did not have to prepare much for the community meal the next day. Basically, she’ll made the Chili in Indian Sauce for the community meal entree and salad for the sides. We helped Karen to wash and chop two big boxes of greens to be used for salad the next day. The food bank also donated two large platters of cookies for the community meal and that takes care of the dessert. A sherry vinegar which has quite a strong sour taste. A lemon infused olive oil which has a very nice lemon flavour. 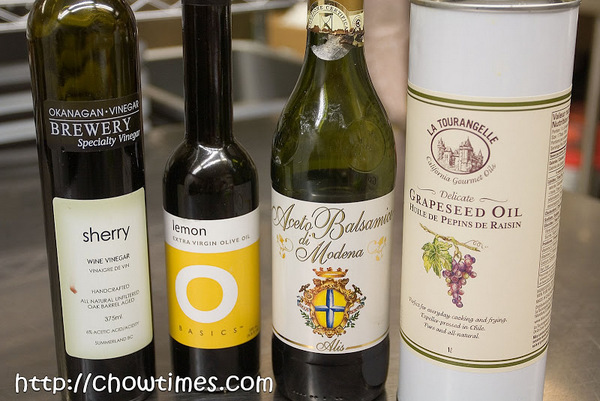 A balsamic vinegar which is mellow and smooth, not too sour. The grape seed oil does not have any flavour in it which is very good for cooking because of its neutral taste. We also compares the oil with an ordinary olive. We did the tasting with some bread. Bing a typical Chinese who do not serve salad at home, I have very little knowledge of vinegar and oil. When I walk into a gourmet store with racks of vinegar and oil, I’m just lost. Anyway, it is a good experience to taste some of these vinegar and oil which I have never used before. 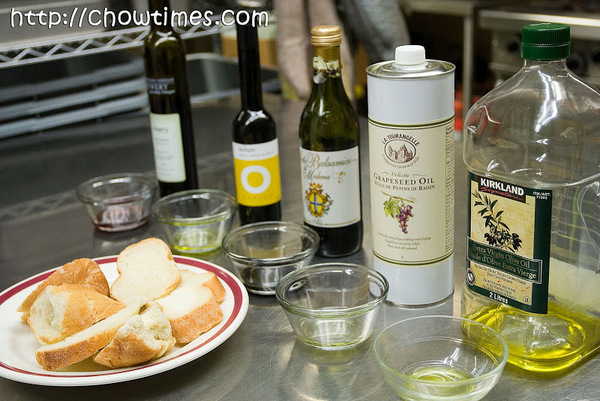 So, what is your favourite vinegar and oil? Karen made a Chili using some Indian Sauce she got from the food bank. It is a good way to introduce new flavour to your family to expand their culinary experience. This is a vegetarian dish. 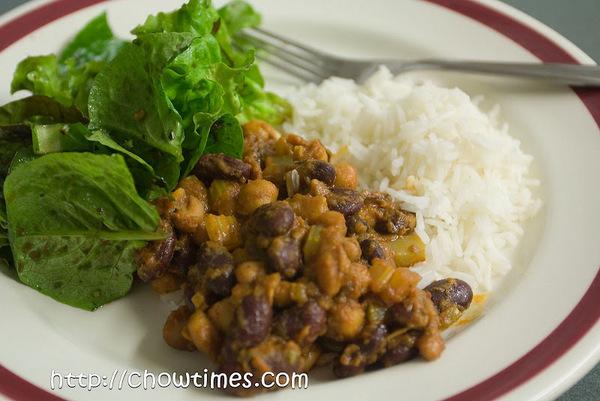 Karen served the chili with basmati rice and salad greens on the side. The Chili in Indian Sauce is so simple and quick to prepare. The sauce is sold in microwaveable pouch which is ready to eat. 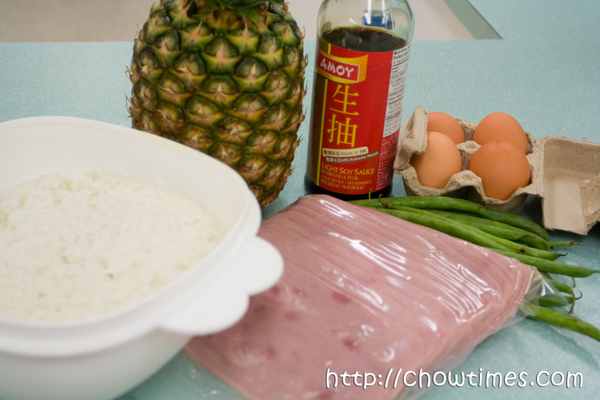 Vanessa also made some Roast Pork Rice Paper Rolls to serve with the Pineapple Fried Rice. The roast pork is bought from the best roast pork stall at Parker Place in Richmond. 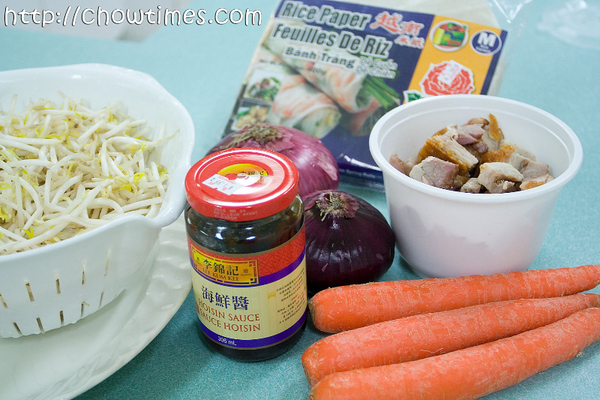 The Roast Pork Rice Paper Roll is best served warm, unlike the Vietnamese Shrimp Rice Roll which is served cold. Click on the link below for the instructions. Vanessa kicked start the the South Arm Community Kitchen with two of her favourite dishes. The first dish is Pineapple Fried Rice. Many Chinese made fried rice at home. It’s a good way to use left over rice and meat. Nanzaro often asks me to cook extra rice so that he can fry rice for supper or breakfast by himself. 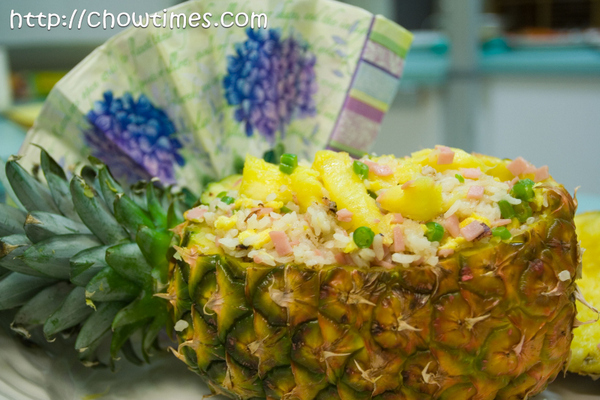 Vanessa kicked it up a notch by using the pineapple shell to plate the Pineapple Fried Rice. This is just like what we get at high end restaurant which comes pricey. Vanessa showed us how to make this from our own kitchen. 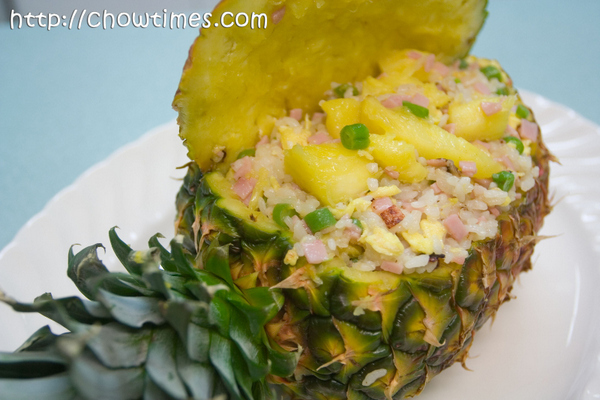 We simply love the presentation of this Pineapple Fried Rice. 1 whole pineapple, not too ripe.